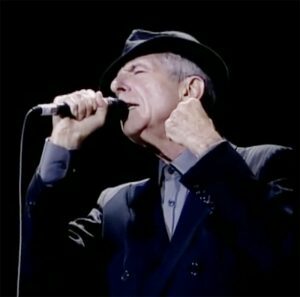 Just 10 days before Rosh Hashanah, on his 82nd birthday, Leonard Cohen released the title track from his latest and, sadly, his very possibly last album, You Want It Darker. It is a breathtaking reminder of his spiritual depth and artistic power. The song is a uniquely Cohenesque form of Midrash and Psalm, a troubling twist on the Akedah, which, as Cohen knows, will be read next week, on the second day of Rosh Hashanah. It deserves—and no doubt will receive—its own exegesis. 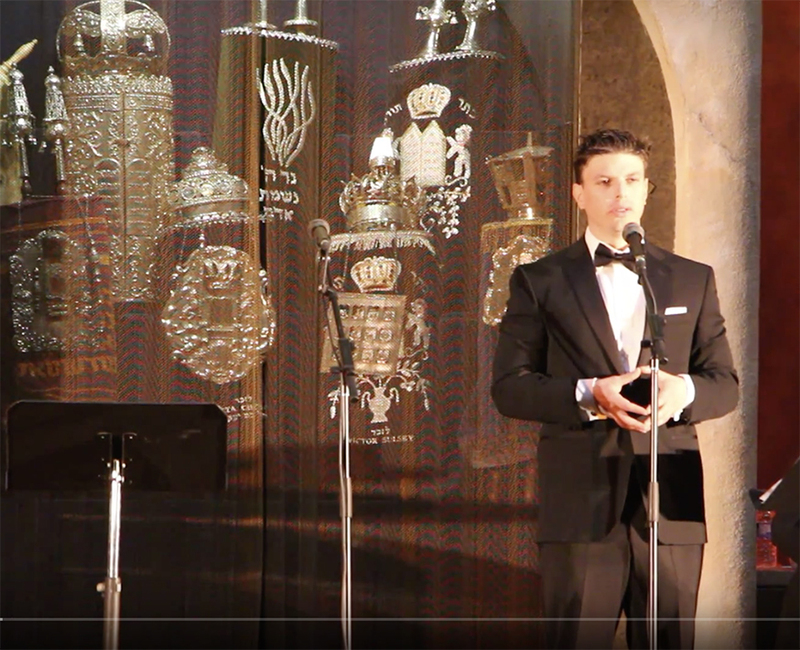 But Cohen has given us a second gift this fall: He has reminded us that khazones, the classical Ashkenazi cantorial art, is undergoing an exciting revival with young cantors such as Shaar Hashomayim’s Zelermyer leading the way. Let’s return to Zelermyer and his choir leader Azoulay, here accompanied not by Leonard Cohen and the Shaar Hashomayim choir but the McGill Chamber Orchestra, performing the two powerful paragraphs linking Unetaneh Tokef to the Kedusha (“man is dust and to dust he shall return,” the classical paytanim could go dark but beautiful too). Zelermyer is part of a generation of incredibly gifted young cantors whose vocal production and mastery of the incredibly complex techniques required to sing classical khazones, I would argue is impressively, amazingly close to those of any of the great masters of the Golden Age of Cantorial Music, such as Moshe Koussevitzky (1899–1965), with whom Hershtik sang as a young man, the fabled Yossele Rosenblatt (1882–1933), and (for my money, the greatest of them all) Zavel Kwartin (1874–1952). When I first moved from Montreal, a city historically blessed with an overabundance of great cantors, to Manhattan, my second most dispiriting experience (the first being the major cost and minor size of my apartment) was the paucity of traditional cantors to be heard anywhere on this Jewish island. As I was raised in an Orthodox environment, and trained by my father Yossel Nadler in the kind of khazones only heard in Orthodox shuls, I was stunned to learn that only two synagogues in Manhattan employed what my Dad (himself a wonderful, but determinedly part-time cantor) and I would snobbishly consider to be “proper” hazzanim. Both were on the East Side: Joseph Malovany at the Fifth Avenue Synagogue and Ari Klein at the Park East Synagogue. Even more disappointing is that neither of these great cantors were accompanied by choirs, except on the High Holidays. The Lincoln Square Synagogue had the lively, warm, and musically engaging Sherwood Goffin, but his style was that of the folk singers of his youth, not the cantors of the classical age. The elite Jewish Center on West 86th Street had been under a no-cantor ban established by its founding rabbi, Leo Jung. Quite frum back then, it was my desperation to hear a “proper” hazzan, namely the superb Dov Keren (who is still the shul’s cantor), that led me for the first time in my life to sit next to and daven with the women in the pews of the Conservative Sutton Place Synagogue, with rapidly decreasing discomfort. How things have changed! Where khazones was once banned by the anti-musical edict of Rabbi Jung, the Jewish Center’s services are today led by Chaim Dovid Berson, a magnificent lyrical tenor who combines traditional, “proper” nusach ha-tefilla with both classical and contemporary styles of khazones. Listen to Berson’s rather daring decision to divide his Unetaneh Tokef between a modern, secular Israeli version before returning to the classical communally sung refrain, familiar to the Center’s congregants, of Be-Rosh Hashanah Yikateivu (on Rosh Hashanah our decree is written). 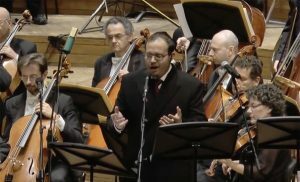 That Berson, an Israeli alumnus of the haredi yeshiva world, now sings this most hallowed of High Holiday prayers to a tune commissioned by a far-left, secular kibbutz in the wake of its devastating losses during the Yom Kippur War shows that the erasure of borders begun by Berson’s teacher Naftali Hershtik when he joined the Israel Philharmonic Orchestra on the stage of Heichal Hatarbut continues in the works of his students. The relatively new, and very young, cantor of Manhattan’s Lincoln Square Synagogue, Yaakov “Yanky” Lemmer was raised (and remains) a Hasid. While a Hasidic cantor in full regalia (Hasidic kapoteh, not a cantor’s gown, that is) leading the prayers at a Modern Orthodox synagogue is hardly new—for the past two generations, the Hasidic community has produced some of the world’s greatest cantors, including Isaac Meir Helfgot and Yaakov Y. Stark—Lemmer’s musical imagination and his broad interest in other musical traditions are. Here is Lemmer singing with the profound feeling of an Old World cantor, the moving, almost desperate imploration to God to hear our tears, Shomea Kol Bichyos, taken from the Neilah service that concludes Yom Kippur, accompanied by Frank London and his klezmer musicians, a demonstration that the revival of khazones has come full circle, now joining in the revival of its largely secular klezmer cousin. 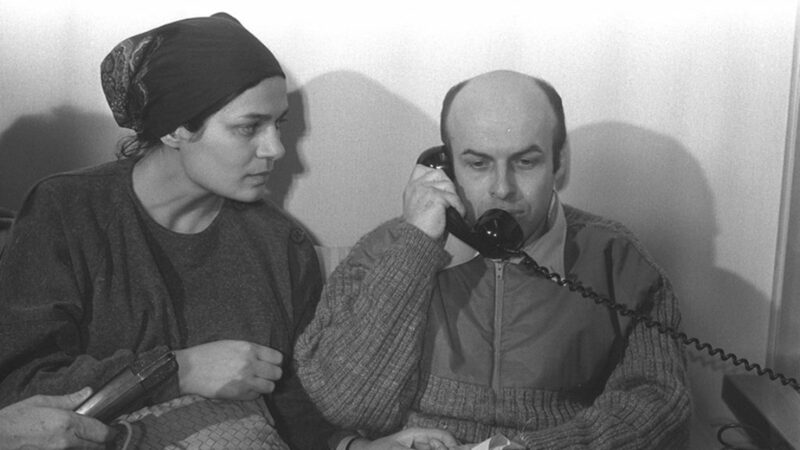 I admit to having been skeptical when I heard about the Lemmer-Frank collaboration, but the result shows that they have expressed the broken-heartedness required of a tefilla that speaks of God hearing and gathering into Himself the collective tears of his chosen but tormented people, the krekhtzen—is that translatable? It is a kvetch on crystal meth—the deliberately broken notes are brilliantly amplified by London’s trumpet. Perhaps the most cerebral (in this case very literally) of today’s hazzanim, Zevi Muller spent years immersed in talmudic learning at the Ponevitch Yeshiva and then Beth Medrash Govoha, the Harvard and Yale of Bnei Brak and Lakewood, New Jersey, followed by even more years studying neuroscience at Columbia University, where he is now working on his doctorate. Perhaps unsurprisingly, Muller’s greatest gift, aside from an impressively multi-ranged and rich voice, is his exactitude. When I first heard him, at last year’s Selichot, I was struck by his meticulous diction, a quality alas never taken for granted even among the world’s greatest cantors, as well as his wide range and vocal coloration, allowing him to oscillate seamlessly between lyric and dramatic moments. Muller’s rendition of Mordechai Hershman’s Halben Hata’einu, the standard refrain in all the services of Yom Kippur, shows Muller’s great gifts (do your best to ignore the pianist). 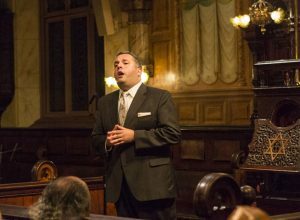 Cantor David Guber is also a truly gifted performer, a natural, with a stage presence very rarely found among cantors since the death of the two greatest ladies’ men of khazones, Moishe Oysher (1906–1958) and Pierre (ahem) Pinchik (1900–1971). Here he sings Av ha-Rachamim/Kehilos ha-Kodesh, recited every Shabbat before returning to Torah to the Ark, but most dramatically at the end of Yizkor on Yom Kippur. 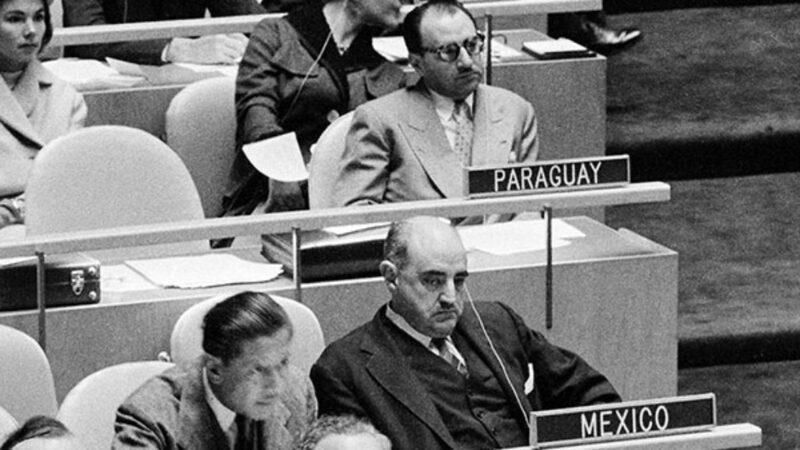 My choice of this particular piece, aside from Guber’s mastery of its every nuance, is the elderly man seated to Guber’s immediate left, but almost jumping from his chair out of his abundance of love and enthusiasm, namely the unbridled nakhes fun a Yiddish’n tateh, Cantor Shlomo Guber, who was the senior cantor of the prestigious Berea Synagogue in Johannesburg, where David was raised before the Gubers made aliyah. We all know that most popular of old Zionist standards from pre-statehood Jewish Palestine, “Tzena, Tzena,” calling upon the girls to come out and behold the chayalim ba-moshava, while instructing them to abandon shyness in meeting these sons of valor, men of arms. A decorated veteran of the IDF, where he served during the 2006 war in Lebanon as sergeant in the legendary 890-Brigade of the Tzanhanim, or paratroopers, Guber embodies in equal measure the heroism of his generation of IDF soldiers and the tenderness of the cantorial music which he so mimetically imbibed from his father. Zvi Weiss, the final master of our selective, but hardly arbitrary, Hamishah Humshei ha-Hazzanim ha-Hadashim, sounds to me like the one with the most authentic Old World sound and style. I first heard him singing not live in shul or stage, but on a cheap CD recorder in the back room of Montreal’s finest kosher bakery, Chezkie’s, whose owner and namesake is a hugely learned fan of khazones. While I could not quite identify him, I was sure he was a long-dead Hungarian or Galician survivor cantor from the mid-20th century, someone like Yehoshua Wieder or Moshe Stern. Weiss is, however, no Golden Age impersonator. He, too, was trained by Hershtik, and he masters the classics with his own unique sound, combined with a vocal endurance that still manages to take my own breath away. 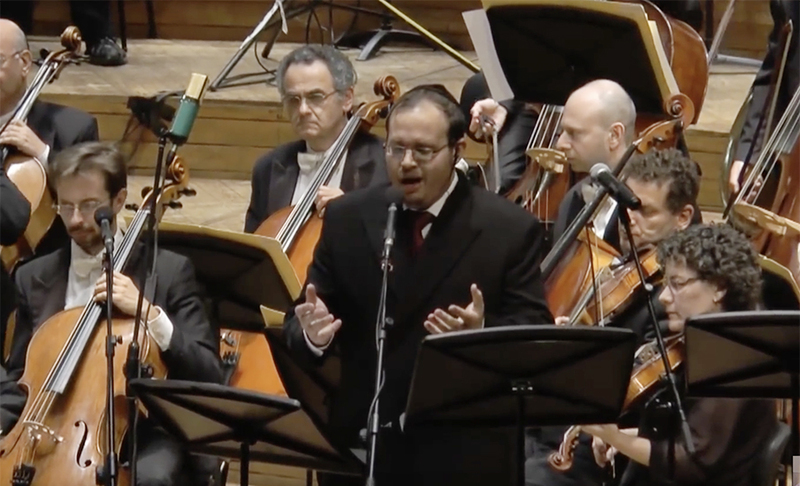 Here is Weiss chanting the emotionally charged version of the festivals’ Mussaf classic, Umipnei Hata’einu, by Rapaport, performed, as it happens in the same Heichal Hatarbut. There are many other versions, of course, the most popular one being that recorded by Moshe Koussevitzky, but Rapaport’s is by far the most demanding and stamina-testing, and the young Cantor Weiss just nails it and remains standing. It’s actually astonishing to behold. Now that you have listened, go back to 2:30 and listen again to how he narrates the prayer—such hazzanim used to be called “zogers,” somewhat similar to St. Louis Blues “shouters” like Bessie Smith and Louis Armstrong—an almost lost art. At the same time his rich coloratura is just short of the greatest master of that technique, Zavel Kwartin (who himself composed two settings for Umipnei Hata’einu). Let us now conclude our service, errrr, I mean survey, with, what else but “Adon Olam”? Actually, make that a double—a joyous and fun-filled medley of that ultimate closing hymn of all major Jewish services, allows us to sneak in two other superb young cantors, Azi Schwartz and Simon Cohen, both of whom are blessed with gorgeous tenor voices, followed by a similar medley of “Adon Olam” featuring the Upper West Side’s three young new cantors, Chaim David Berson, Yanky Lemmer, and Zevi Muller. Allan Nadler is professor of comparative religion and director of the Program in Jewish Studies at Drew University. He was rabbi of the Shaar Hashomayim from 1981 to 1991 and, more recently, of Temple Beth El from 2012 to 2015; both are in Montreal. He is currently writing a history of the concept of heresy in Jewish thought. I'm surprised you made no mention of Chazzan Jackie Mendelson. The documentary about him, A Cantor's Tale, is all about this topic. http://www.imdb.com/title/tt0374568/. Additionally, there are many fine Conservative cantors keeping this tradition alive. I'm surprised you didn't mention Shai Abramson, the Chief Cantor of the IDF. His Unetaneh Tokef is filled with meaning and yir'ah, awe. Reformers and democrats are the real hope for a future of peace, liberty, and stability in the Middle East. This historic moment presents the West with a remarkable opportunity. Sharron Flatto and Allan Nadler exchange views the Prague golem, Kabbalah, and Ezeliel Landau.